Natural care anti global age concentrated in oil of prickly pear oil seed and and formulated specifically to bring strength and energy to the lax and dull skins. Also composed of pure hyaluronic acid (anti-aging), Xylitol (hydrating), argan oil and beeswax (nourishing) and an exceptional shine revealer that synthesizes collagen (elasticity and regeneration fabrics). With a tighetening effect that acts through effective association of 5 super moisturizing and a sip of anti aging ingredients including oil of prickly pear seed (an antioxidant exceptional). Ages and Merveilles with its soft and rich texture brings comforts for skin that looks less tired, and radiant. Rare and precious oil - Anti-wrinkle and remarkable eye contour - Reduces stains. Serum 100% Prickly pear oil is the fetish oil of customers in search of natural effective. With 99.30% of seed oil (the percentage remaining stabilizes to avoid its rancidity), it penetrates instantly and acts as a true bosster of efficiency. Its oil texture in perfect affinity with the skin penetrates quickly without leaving a greasy film. Prickly pear oil has a very high rate of tocopherol (vitamin E), an exceptional natural antioxidant. By playing a protective role against free radicals responsible for skin aging, prickly pear oil improves the natural appearance of mature skin. It is a true elixir of beauty. For mature skin, excellent anti-wrinkle. 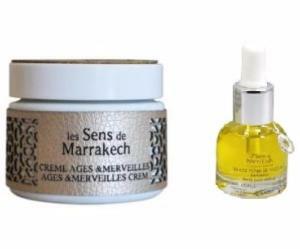 Apply the pure argan oil or prickly pears, the effect of the cream will be increased tenfold. - Prickly pear seed oil: Anti oxidant, excellent protector against the free radicals responsible for the premature aging of the skin. - Glycine Lipovector: Increases the luminosity of the skin, synthesizes and organizes collagen. - Pure Hyaluronic acid: Moisturizing and anti-aging. Gives the skin resistance and elasticity. - Xylitol: Hydrates, quenches and optimizes the water flow of the skin. 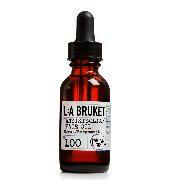 Boosts the effect of hyaluronic acid. 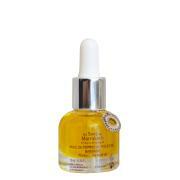 - Argan oil: Anti oxidant which soothes and nourishes in addition to the oil of seeds of prickly pears. - Beeswax: Limits water insensitive losses. - Glycerin: Capture the water. Oil prickly seed (99,30%) : exceptional antioxidant power, plays a role in protecting against free radicals responsible for skin aging. Apply morning and evening on the face and neck perfectly clean and dry. Our advice: In order to thwart the natural sagging skin, apply your cream from the inside to the outside of the face and from the bottom to the top. Finish in vertical smoothing of the forehead with the 2 majors ..